No arrest has been made in connection with the death of Michael Moore; meanwhile, the condition of his roommate, James Ford, has deteriorated. Smoke inhalation caused the death of the man who died a day after being pulled from a fire at the apartment house where he lived in Biddeford, the Office of Chief Medical Examiner confirmed. Meanwhile, the condition of his roommate has deteriorated. Michael Moore, 23, and his roommate, James Ford, 21, were removed unconscious from their apartment at 35 Main St. early Thursday morning after a fire was set there intentionally, investigators said. Moore died Friday afternoon at Maine Medical Center in Portland. Ford was listed in serious condition at the hospital on Monday, an improvement from earlier. But on Tuesday, his condition had worsened and he was again listed in critical condition, a hospital spokesman said. The medical examiner performed an autopsy Monday on Moore’s body and determined he had died of “inhalation of products of combustion,” including particulates and superheated gases. Although authorities are treating the case like a homicide, the medical examiner has held off on asserting that conclusion, saying the manner of death is pending further study. If someone dies in a fire that is set intentionally, it is usually considered a homicide. The Maine State Police, which investigates most homicides in Maine, has taken over as the lead agency in trying to identify the person responsible for the fire, though the Office of State Fire Marshal continues to lead the investigation into the cause of the fire. Officers from both agencies are working side by side on the case. Samples taken at the scene have been transferred to the state police crime laboratory in Augusta for testing, which could show whether an accelerant, such as gasoline, was used. The fire broke out just before 4 a.m. Thursday. A police officer, first on the scene, pulled fire alarms in the front of the building and pounded on doors at the rear to wake residents. The fire started in a rear stairwell leading to the second floor of the back half of the 14-unit building. People in the front half of the building — two floors of efficiency apartments and a first-floor apartment behind a storefront — were able to get out, and their belongings were not heavily damaged by fire or smoke. 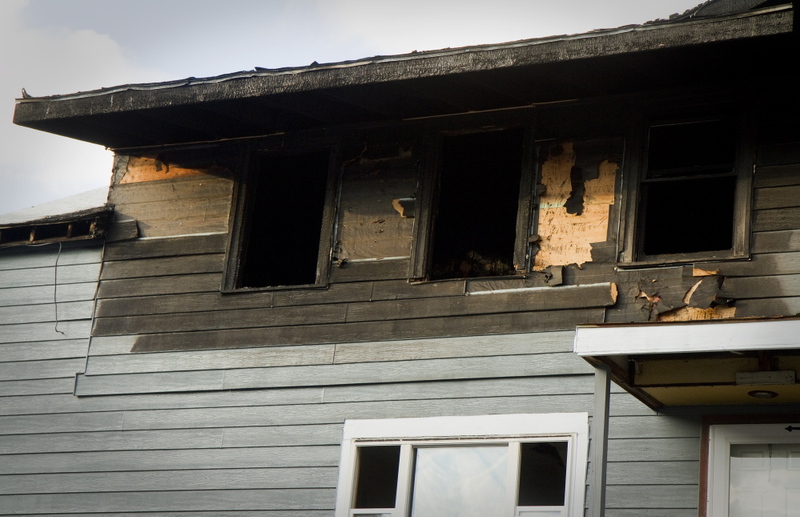 The fire badly burned the second floor of the building’s back portion. A family of three children and three adults was able to get out of the first floor. A family of three was helped out a second-floor window. Moore and James were found in their respective bedrooms in the finished attic. Investigators with the fire marshal’s office found no working smoke detectors where James and Moore were staying and there was no fire escape from that portion or from the second-floor apartments. The property owner could face sanctions or criminal charges if authorities conclude the building violated life safety codes. Authorities released no new investigative details Tuesday and had made no arrest by early evening. The Main Street fire was the first of two arson fires within the span of three days. A half-mile away, at 5 Simard St., another fire was set in a two-unit apartment building Sunday night. Police on Monday arrested Jason McGarey at his home on Pool Street about five blocks from the fire and charged him with burglary and arson. He is being held in lieu of $25,000 bail, and no date had been set for his next court appearance. McGarey broke into the apartment where his former girlfriend — the mother of his child — had lived until recently, police said. The apartment had been vacant since it was raided by the Maine Drug Enforcement Agency. McGarey set a number of fires, police said. The building’s owners lived in the other unit and called police when they heard somebody in the vacant apartment. McGarey paid a $300 fine in July after being convicted of harassment by telephone, according to the State Bureau of Identification. He also was charged with violating a protective order in 2011, and violating privacy in 2009.